During the ten years between 2000 and 2010, Jalisco’s population increased by over a million from 6,322,002 to 7,350,355. Suburbs around Guadalajara dominated demographic change increasing by 887,301 (43.2%) to 2,940,118 (see Population change in the Guadalajara Metropolitan Area). The greatest growth was in the southern suburb of Tlajomulco which grew 237% from 123,619 to 416,552. Interestingly, the population of the central city of Guadalajara decreased by 152,185 to 1,494,134. In this post, we look at the pattern of population change for the other municipalities in the state of Jalisco. The map shows the average annual percentage change in population for the period 2000-2010. It is worth noting that the population of a place with an annual growth rate of 3% will double in about 24 years. 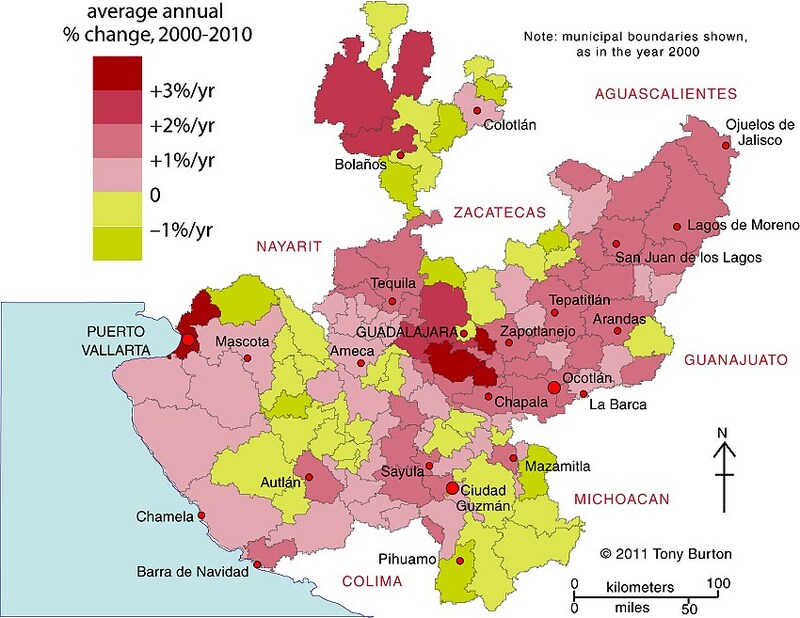 Population change in Jalisco, 2000-2010. Copyright Tony Burton. Click image to enlarge. What other areas of Jalisco are growing fastest? Puerto Vallarta, the other major urban area in the state, grew by 38% to 255,725. The northern suburbs of Puerto Vallarta in the state of Nayarit grew even faster. The other major ex-pat area around Lake Chapala grew more slowly. Chapala grew by 12.4% to 48,812, Jocotepec by 18.0% to 42,142, while Poncitlan increased by 18.6% to 48,407. Jalisco grew by 16.3% during the decade or an average increase of about 1.5% per year. But rates of population growth varied greatly from one area to another. As indicated in the map, many of the isolated rural municipalities in the state actually declined in population (yellow-green and yellow areas). While births in these rural communities generally exceeded deaths, they experienced significant out migration. In addition, many other rural communities in western Jalisco grew slowly at less than 1% per year (light pink on the map). Most of the communities in eastern Jalisco grew 1 – 2% about the same rate as the state as a whole. Surprisingly, three of the most isolated municipalities in far northern Jalisco grew rapidly at over 3% per year. These municipalities are home to many indigenous Huichol Indians. Only relatively low numbers of Huichol Indians have migrated away from their ancestral homelands, so out-migration from these municipalities is much lower than from other remote parts of the state. In recent years, mining activity which was the mainstay of the economy of this area in colonial times, has made something of a comeback, thereby increasing local economic activity and opportunities. Methodological note: The map depicts the municipal boundaries as they existed in the year 2000. Since that time, the municipality of Arandas has been split into two, reducing its territorial extent, and creating the new municipality of San Ignacio Cerro Gordo.